Everyone loves a precious little girl they can dress up in frilly dresses and hair bows. They capture the hearts of every daddy in the world! Here are some who are waiting for their family at the end of Reece’s Rainbow. 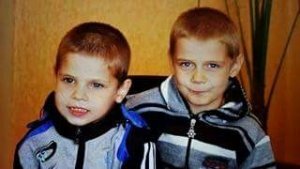 Their special needs include such things as arthrogryposis, CP, spina bifida, FAS (Fetal Alcohol Syndrome), Autism, and other diagnoses. 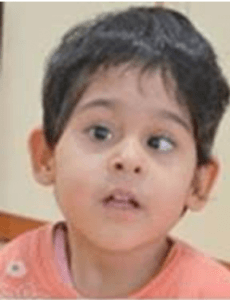 Eden is completely blind and has profound hearing loss. 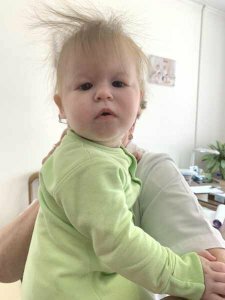 She received bilateral cochlear implants and is responding to sound and making many new sounds, although not yet saying any words. 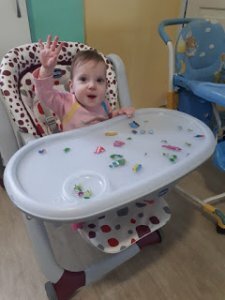 Eden has delayed milestones as a result of having no visual or auditory input for so long, but we are excited to see how she progresses over the coming months. She attends an on-site preschool every morning. She can sometimes get overwhelmed by the new sounds she is hearing, and when she feels this way, she tries to take her speech processors off. Eden has some self-stimulating behaviors. She loves to splash in the water and is getting better and better at walking independently with her guide cane. She loves to swing and rock in her rocking horse. She loves to cuddle. She has started to take several steps on her own, and also while holding onto a push toy (pre guide cane) or her cane. 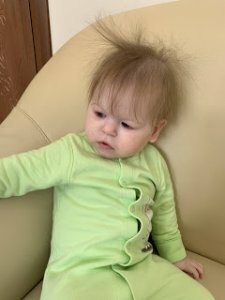 Jan 2019 update: Eden has started moving around the home with purpose more independently. She is now able to climb up 3 flights of stairs while holding onto the rail for support. She is also able to come down the stairs, also holding onto the rail for support. 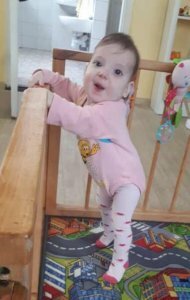 Eden has always been quite the acrobat and has now learned to climb on the sofa in the home and will stand while holding onto the back and jump and giggle. She has also learned to find a low hanging disc swing in the home and climb on it. She loves the swing and will vocalize sweet sounds as she enjoys the motion. Eden continues to work with her guide cane and still needs encouraging and prompting to use the guide cane throughout the day. She takes daily walks down the street with her teacher. She mostly enjoys the walks, unless she is tired, then she cries to be picked up and comforted. Eden continues to wear her processors allowing her to hear and she often responds to the sounds of toys falling on the floor, familiar voices, and music. She does require frequent prompting to complete activities in her classes. Eden also continues to demonstrate some aversions to a lot of textures. This is addressed in the home through a lot of opportunity for sensory play. She enjoys having lotion rubbed on her, sensory brush actives and water play. 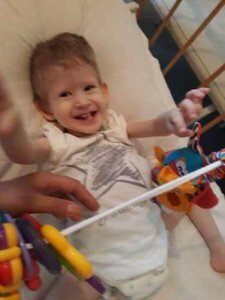 Eden has a $500 matching grant! 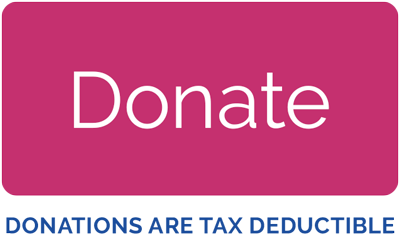 When her grant reaches $1731.90, she’ll receive an additional $500! $1,503.10 has been donated towards the cost of my adoption! $1,814.39 has been donated towards the cost of my adoption! Addison is a petite and precious three-year-old girl who loves to be cuddled. 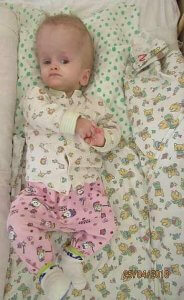 When Addison was younger, she could walk independently and she had good fine motor skills. She could take small things out a bottle, turn the pages of a book, and take off her own socks. Addison loved to wave hello and goodbye, clap her hands, and blow kisses. Her nanny adored her and often took her to play on the playground. Addison could speak simple words, such as mom and sister and she could understand the adult’s instruction. She was described as cooperative, active, full of expression, and adored. Addison was sometimes mischievous and would occasionally lose her temper, as any 2-3 year-old would. She enjoyed the rocking horse and playing with balls. 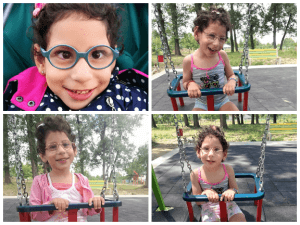 In April of 2016 she started having seizures and was sent to the hospital for treatment. She does have a CT scan in her file which was normal, but once Addison came back she was like a different child. She had stiff limbs and couldn’t walk or sit. She was able to make small guttural sounds and could visually track moving people. The orphanage decided to have her start rehabilitation training. 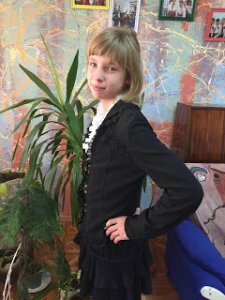 Addison started receiving acupuncture and massage therapy and her muscular tension improved. She can now hold her head up when lying on her stomach and responds to toys that make sound. She knows her name and will look when called. She still makes good eye contact, but has less facial expressions than she used to. She now imitates making sounds and recognizes people. She is still attached to her favorite nanny and enjoys when the nanny spends time with her. She will cry when the nanny leaves. Her nanny spoon feeds her porridge and she often bites the soon tightly and sometimes has trouble swallowing. 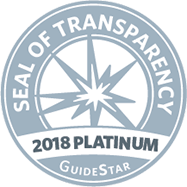 The agency has received a recent update. This sweet little girl has been through so much without a family by here side. It is our hope that the perfect family for her comes forward and meets her where she’s at and helps her reach her fullest potential! $1,006.42 has been donated towards the cost of my adoption! 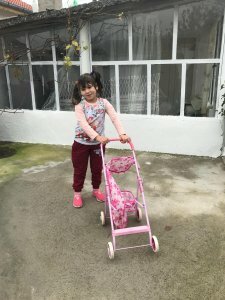 January 2018 Written Update: Lexie will be 5 years old in February. 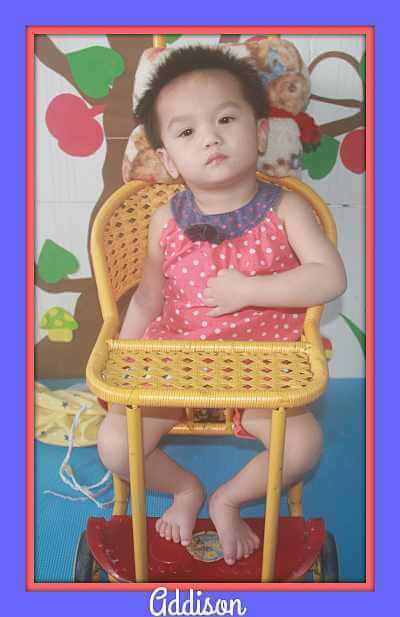 She has been attending preschool for 1 ½ years. She comes to school Monday-Friday from 8-4:30 pm. 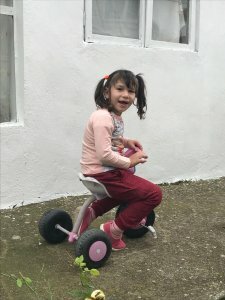 For a little while she was in foster care organized by another nonprofit that works in her orphanage but for the last year she has been living in the orphanage. There are currently 9 children attending this school. Most of the other children came when they were older and have additional special needs. None of the other children are verbal and we believe this has affected her development as well. She doesn’t have any peers she can interact with. Even though the other children are older than her they are developmentally behind. She can speak in short sentences. She can make some requests and sometimes answer simple questions. In the last few weeks we have seen a change in her behaviors. She used to be a very happy little girl who played easily on her own or with teachers. She used to be able to follow commands and two step directions. She could sing along to songs. Now she seeks people out and wants to be with someone all the time. If they don’t respond right away she will start hitting herself indicating she needs someone to be with her and help her regulate. She is generally happier when she has a person with her. The teachers have had to assign her a teacher as her hands were becoming bruised and swollen. The teacher is worried about how the orphanage is affecting her and she has brought her out of the orphanage on weekends and she has never hit herself when they are together outside of the orphanage. They have a really sweet relationship and she is comforted by her when she is upset. 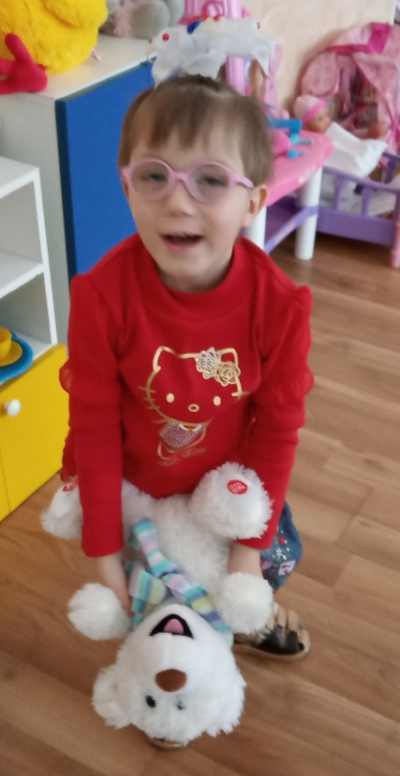 There is a $1,000 agency grant for Lexie’s adoption with her current agency. 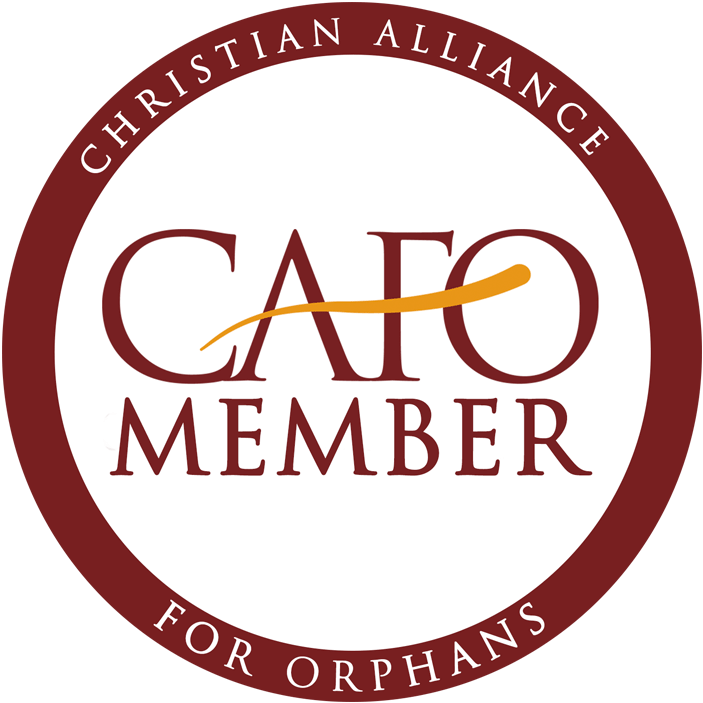 Other grants may be available based on the adoptive family’s circumstances. Agency grants are awarded as agency fee reductions. 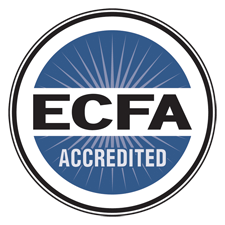 The agency has videos available, too. 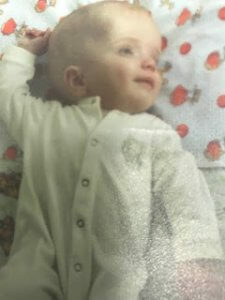 Margaret was born with some complications and has been diagnosed with Spastic Cerebral Palsy, Strabismus and Epilepsy. She had to receive help when eating, and she continues to use a G-tube at the moment when she eats. Margaret is a warm and cuddly little girl. Almost 2-years-old, Margaret knows how to charm her caregivers, and she receives lots of attention. She is currently living in a baby home in Eastern Europe. 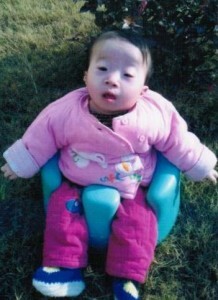 Margaret was born with some complications. She had to receive help when eating, and she continues to use a G-tube at the moment when she eats. 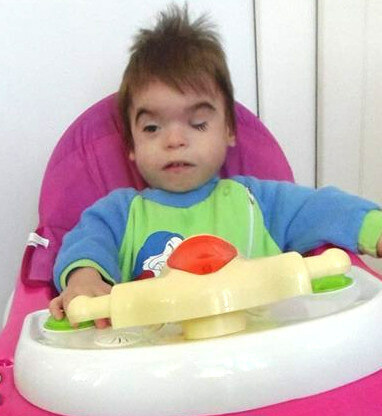 Music and musical toys make Margaret very happy, which she expresses by smiling and making baby sounds. 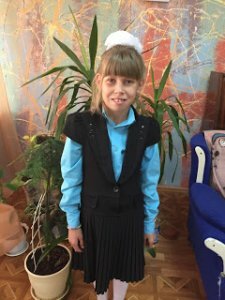 Margaret has global delays and receives support and intervention from specialists in the orphanage. 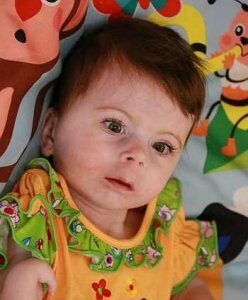 Sade has been diagnosed with Holoprosencephaly and is currently residing in a specialized facility where she received medical care and permanent rehabilitation services. Sade enjoys interacting with adults and will communicate with them by touching their face and laughing when they tease her. She happily observes other children at play and displays a mostly calm personality. 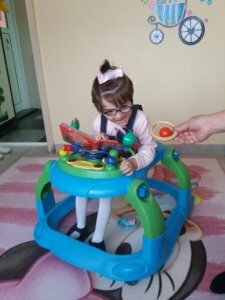 It has been reported that, although her movements are stereotypical, she is staring to develop control over fine motor skills and her gross motor skills are improving as well. 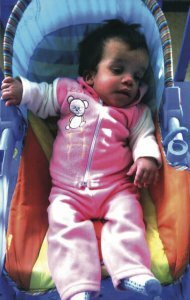 Sade needs a family that will nurture her and help her get the ongoing care that she needs. Karen loves social interaction and receiving lots of love and attention. 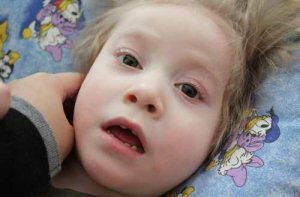 She has several special needs conditions, which include CP, microcephaly, epilepsy and Strabismus. Despite these challenges, she is able to do many things. She can crawl to get around and walk with assistance. She also does well playing alone with toys and if one catches her attention she will spend a long time studying it and playing with it. She especially enjoys noise maker toys. Karen is non-verbal and her communication consists of syllabic patterns. She makes attempts to repeat different sounds and syllables. She has no trouble bonding with her caretakers and does not have any issues with eating or sleeping. Scarlet was originally listed with her brother, Rhett. Rhett has been adopted. $6,343.60 has been donated towards the cost of my adoption! Look at that hair! Adorable! Precious baby girl! What a gift to have her listed so young. At the age of two days old, she was operated. Now the hole in her spinal column is closed, but she needs the second step, next surgery. Mentally she is developing normal, she can grab things, she does the baby talk, she makes eye contact, she cries very seldom. $3,000.79 has been donated towards the cost of my adoption! Maggie is a precious little one who has just turned 2. 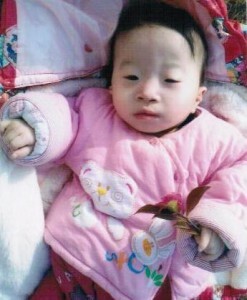 She arrived at the orphanage when she was about 6 months old; a frail and quiet baby girl. 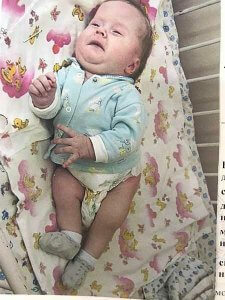 She was found to have a cleft lip and palate, CHD (PDA), and the ring finger and middle finger of her left hand fused. She had the lip surgery in 2014, but no palate surgery yet, to our knowledge. 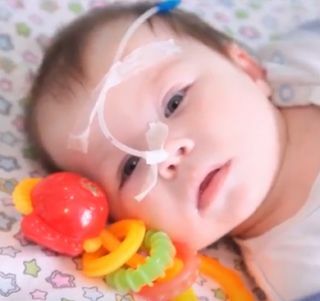 Her heart defect, Patent Ductus Arteriosus, is not at all uncommon. An x-ray of her hand showed mostly adhesion of the adjacent skin of the two fingers. Maggie has delays of both motor skills and speech. It is difficult to say if the delays are due to her known medical issues (plus unknown care for her first 6 months), or if there may be another cause. We do know Maggie needs help. 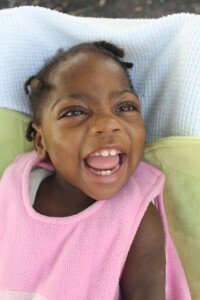 She needs a family to love her unconditionally, and medical care plus therapies to help her reach her full potential. Maggie needs a family. Two year old Wendy is close with her caretakers and likes being held by them. Her file states that she has sharp reaction to outside stimulation such as sound source and visually following objects. She likes being teased, giggling, and can turn over onto her stomach. Her file indicates that she communicates her emotions by facial expression and reacts to being called. Mila turns her head towards sound and looks at people and objects of interest. She recognizes the faces of the staff. She can roll over, but still has difficulty with head control. She enjoys musical toys that spin and will focus on those for short periods of time. Lisa is a happy and sociable little girl. She enjoys meeting new people and interacts with them appropriately. She responds to her name and verbalizes using sounds and syllables. She follows basic directions. Her motor skills are developing. Videos of Lisa show her playing with a ball and manipulating it appropriately. She currently moves around by crawling. 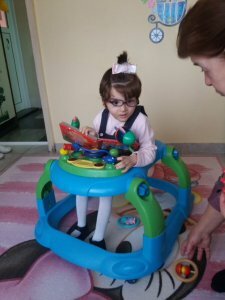 She can take steps when holding 2 hands of an adult and can also move using a walker. She is receiving therapy to help develop her motor skills. Donations will not be accepted until a family is found for Lisa! Becky is a calm child, with positive emotional tone. She is able to demonstrate various reactions of content and discontent. She smiles when spoken to and laughs out loud when jested. Becky recognizes her caregivers and calls them by their names. 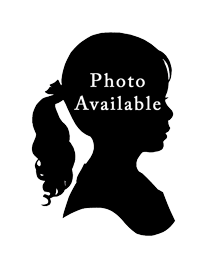 She is sociable and loves being around adults and other children in her group. A significant increase of words in the child’s passive and active vocabulary has been observed in recent months. The number of words she can pronounce is constantly increasing. She understands adults’ speech. Becky answers questions appropriately. She initiates verbal interaction on her own and performs simple instructions. Becky enjoys playing with toys and she can play continuously with them. She plays with toys in accordance with their purpose. Becky is not a picky eater. She has good appetite and is gaining weight. Her sleep is calm. Joely is full of energy and vibrancy. 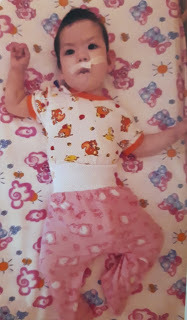 Joely was born with a cleft palate, a deformed/missing right ear, a small meningocele (soft fluid filled mass) at the back of her head, and Congenital Heart Disease – Atrial Septal Defect (ASD). 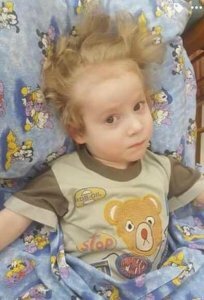 In February of 2014, Joely was diagnosed by the genetics doctor with Oculo Auriculo Vertebral Spectrum. 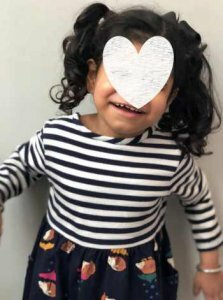 In 2017, she had an operation to repair her cleft palate; however, there are still two small holes in her palate which will need to be repaired again. Her surgeons have stated that her meningocele would need an operation in the future, but that it is not urgent. 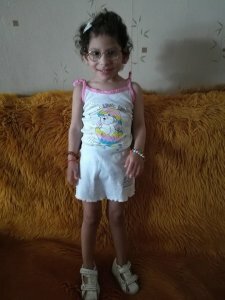 Her doctor recommends continual regular monitoring and checkups with a pediatric cardiologist, but does not see the need for surgery at this point. She shows no signs of heart problems at this time. Joely is fit and active and does not tire easily. Because of Joely’s delays, she currently has weekly occupational and speech therapy as per recommendations. She really enjoys her sessions. Despite her wide range of medical concerns, Joely is really thriving. 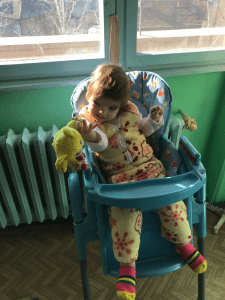 She started attending the local nursery school this year and is adapting well. Her teachers are very fond of her and she holds her own in a class of her peers. Although she is talking, her speech is delayed and she is often difficult to understand, especially for strangers. Her house parents understand her well. Joely is more than capable of making her needs and wants known using a combination of words with facial and hand gestures. She is independent and likes to do things by herself if she can, but will willingly accept help when needed. She follows her daily routine well. 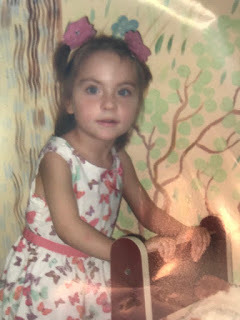 She has become more affectionate over the last 6 months and enjoys all the activities at the child caring agency, especially singing in the nightly devotions. Despite the holes in her palate, Joely is a good eater and enjoys all kinds of foods. She has friends within the center but can be a little rough with younger children. She does well with older children, as she models their behavior. 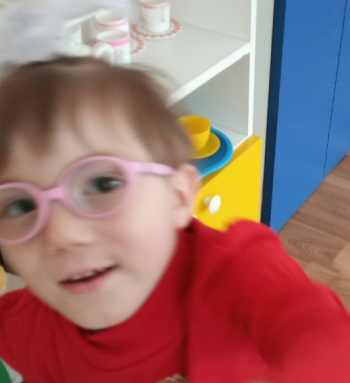 She can be boisterous at times, but she has shown a much higher level of self-control since she started nursery school. 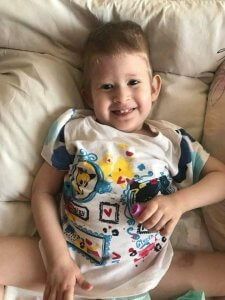 Joely will continue to develop and catch up with the consistency and love of a forever family who have good medical resources and therapists at hand. *Photos and video are available for seriously interested families. Joely is from a small Asian country. 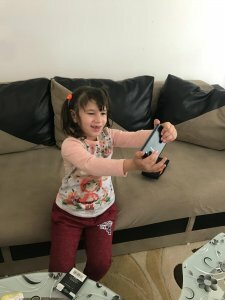 Per her country’s regulations, pictures and videos can only be shared with seriously interested families directly and are not allowed to be shared publicly. 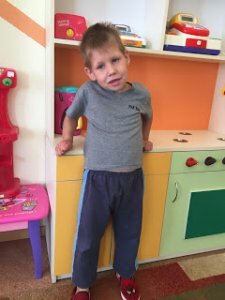 Joely’s file is listed with multiple agencies with a sending program from this country and approval is dependent on the head of adoption in this particular country. 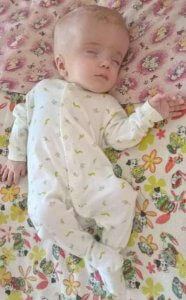 There is a $500 agency grant for Joely’s adoption with a specific agency. $1,000.10 has been donated towards the cost of my adoption! 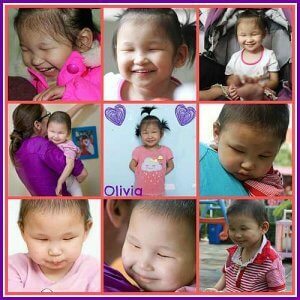 Olivia is an energetic, smiley, and beautiful little girl who likes listening to music and playing outside. She is especially close to her caregivers and loves to be cuddled and tickled by them. 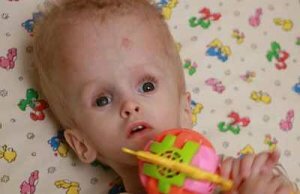 Olivia is diagnosed as having microphthalmia, which means that both of her eyes are very small and underdeveloped. She also has very low muscle tone. She is able to stand with support, but she can’t walk yet. 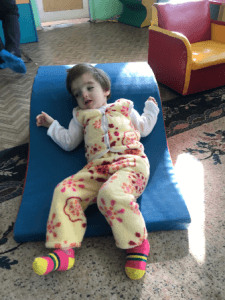 Her caregivers have been working with her, but she still struggles to move independently. She can sit up for about 30 minutes, but she gets tired and often needs support. She knows her name, responds when called, and can follow simple instructions. She can make sounds like “ah,” but doesn’t say any words. She gets excited when her caregivers tell her it’s snack time or time to go play! Olivia has some feeding issues. She mainly eats soft foods like mashed vegetables. She has a hard time swallowing and needs food chopped up for her. She really likes to hold her bottle herself. 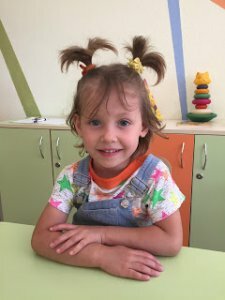 Olivia is in a school program in her orphanage during the week days and lives with a foster family on the orphanage grounds the remainder of the time. 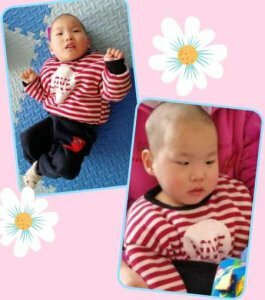 Olivia is making progress, but what she needs most is a family who can provide her with love and therapies that are simply not available in her orphanage! 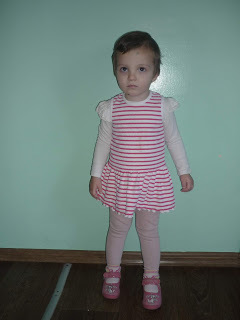 Olivia has a $500 agency grant, with her current adoption agency. Olivia needs a family with an approved home study to be able to hold her file or move forward with adopting her. $1,458.70 has been donated towards the cost of my adoption! 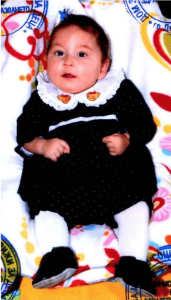 Kaylyn is in severely impaired condition and her development is delayed in all areas. She is completely dependent on adults’ care. Her sleep is calm and rhythmical. She is fed with a spoon by an adult. 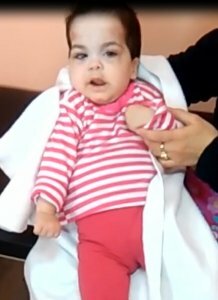 Update Feb 2018: Maddie is a sweet little girl who has developmental delays. 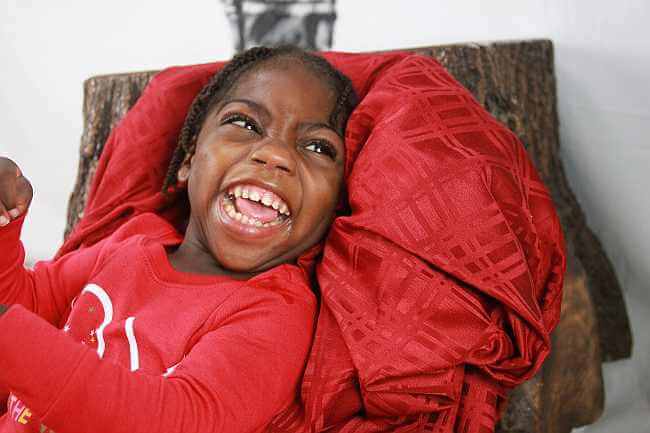 She has not been diagnosed with anything particular, but she does appear to have cerebral palsy of some degree. She prefers to keep her head tilted to one side and tends to be very stiff, however she does great at tummy time and will lift her head up to look around. Maddie also loves to be held and can easily be soothed when you pick her up for some cuddles. Maddie does have a lot of muscle spasms, but we do not think this is seizure activity. She has started a muscle relaxer medicine which seems to be helping her a lot. Despite her delays, Maddie is very observant of her environment; she can often be seen looking at those around her and she has gotten good at tracking people and objects with her eyes. 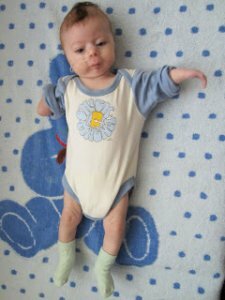 Maddie cannot yet sit up on her own, but when put in a crawling position, she will often move her legs forward like she is trying to crawl. She also bears weight on her legs when put in a standing position. She often is all smiles when she gets to have time in the stander. Maddie is an easy going baby, except sometimes at meal time when she does not want to eat, but she will gobble down anything that has peanut butter in it. She smiles so big when we sing songs and will make herself known if she doesn’t get to see the pictures when we are reading books. Maddie knows who her people are and prefers them over anyone else. She loves kisses and will instantly return the favor with a big smile. Sometimes when she really gets going she will let out a belly laugh that forces you to laugh as well. $2,401.10 has been donated towards the cost of my adoption!